Governor Gary Herbert signs House Bill 472 on Tuesday, March 27. Medicaid expansion—part of it at least—is a go for Utah. Gov. 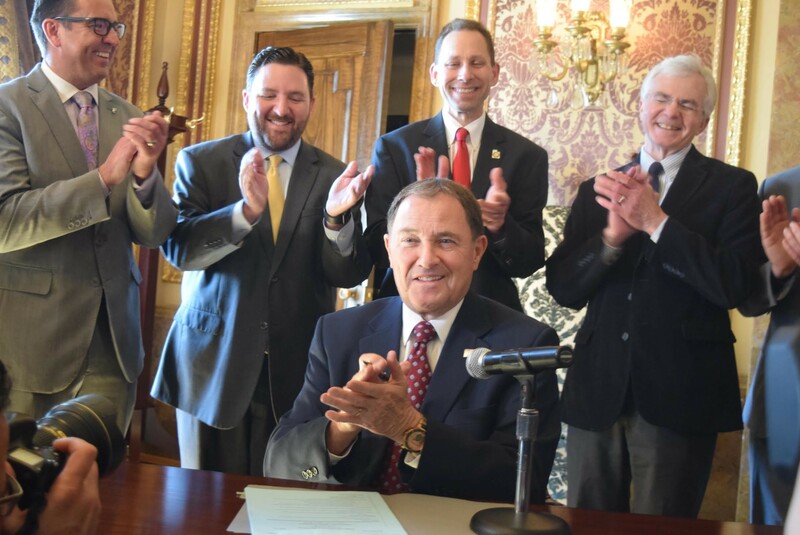 Gary Herbert signed House Bill 472, a measure that will cover as many as 60,000 uninsured low-income Utahns, at the Capitol on Tuesday. The gap Herbert mentioned will expand Medicaid availability to those from zero to 100 percent of the federal poverty line—$12,140 for an individual and $25,100 for a family of four. In the coming years, it could reach thousands more. 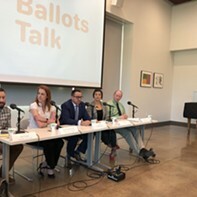 But the bill falls short of covering an estimated 150,000 in the state that a potential ballot initiative will cover if voters approve it in November. That ballot initiative would fully expand Medicaid in Utah to cover all those that would be included under the Affordable Care Act. In other words, it would cover those at 138 percent of the federal poverty line instead of HB472’s 100 percent. With HB472, Utah will also need a federal waiver to move forward with its Medicaid coverage version. The ballot initiative would not require that approval. Bill sponsor Rep. Robert Spendlove, R-Sandy, said he’s “an all of the above kind of guy” when it came to the bill and the ballot initiative and pointed out support from Republicans and Democrats. During the session, the bill passed the House with a 47-27 vote. Eight of the 13 House Democrats voted for itl. HB472 passed the Senate with a 20-8 vote with four of five Democrats voting their approval. State legislators had been reluctant to expand Medicaid after the ACA was passed eight years ago, citing concerns over potential costs. However, this year, President Donald Trump’s administration signaled it would allow several Medicaid expansion changes Utah had requested. Those demands included a work requirement for Medicaid recipients and a provision that would halt the program if the federal government paid anything less than 90 percent of the program’s costs. Utah is on the hook for 10 percent of the expansion costs. 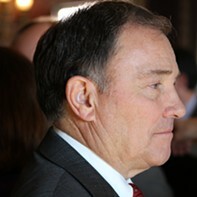 Herbert praised the Trump administration for acknowledging what the state wanted out of its Medicaid expansion. The Medicaid expansion talk isn’t over, either. According to a 2017 poll conducted by the Hinckley Institute of Politics and The Salt Lake Tribune, 62 percent of Utahns either strongly or somewhat support the Medicaid petition. Depending what voters do in November, Utah’s Medicaid coverage could end up covering more than HB472.